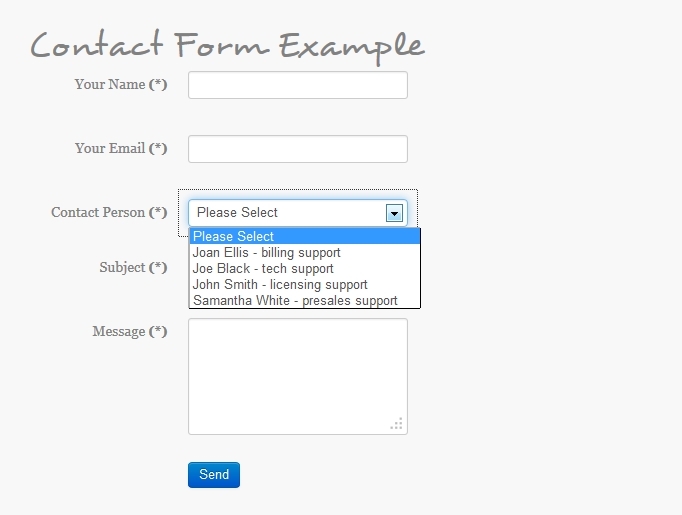 In this example we will create a simple contact form that will retrieve the contact's email address from the default Joomla! users table. 1. 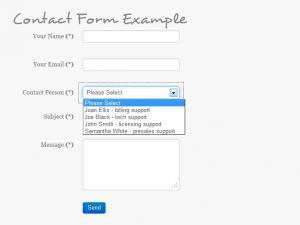 First we will create the form(you can use the form creation wizard and choose the Simple contact form layout). In the wizard please make sure to disable the admin email, we will generate this email through our script. After the form is created you will only need to add an extra field(in this example we have used a dropdown) that will list all your available contacts(stored in the #__contact_details table). The script will be similar to the one presented here. // Now, we need to convert the results into a readable RSForm! Pro format. 3 persons found this article helpful.